At the start of the year Nevada Democrat Harry Reid claimed to have suffered an “exercise accident” in his home while under the protection of the Capitol Police. According to Fox News, the lawmaker fell when an elastic exercise band snapped and hit him in the face. The senator then hit other gym equipment as he fell, breaking bones near his eye. Then when he hit the floor, he suffered a number of broken ribs. 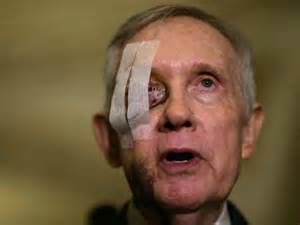 Strangely, Harry Reid’s brother Larry was seen to have similar facial injuries around the same time. The Capitol Police squad who took Reid to hospital after the incident aren’t talking, nor is another man who likely has knowledge of what happened, former Senate Sergeant at Arms Drew Willison. Now, in what some speculate is a continued attempt to cover up the truth about the “accident,” Reid has brought Willison onto his own staff. And if that weren’t weird enough, Breitbart has now also reported that Kim C. Dine, the chief of the Capitol Police who has steadfastly refused to release any information about Reid’s New Year’s Eve “accident” to the media, has suddenly resigned for reasons that are so far unspecified. John Hinderaker of the Powerline Blog reports on a telephone call he had with a counselor from a Alcoholics Anonymous Center in Nevada. The man introduced himself to the group as “Larry” and said that he had been in a fight with a family member at a get-together. He apparently blacked out during the fight at some point, coming to mid-altercation while rolling on the ground with the other family member, his clothes now bloody. He added that now he was concerned that he’d have to deal with the Secret Service. The group didn’t take that last bit seriously — you hear all kinds of things in AA meetings, as you might imagine — but had little doubt from his appearance that Larry had been in a fight. Later the man saw Larry’s photo in a newspaper item and realised he was Harry Reid’s brother. When Powerline asked Reid’s office about the incident, all they received in reply was the cryptic message “Don’t ever change”. The speculation could all be completely off target of course, but whether it is or not, we won’t hear the truth from the mainstream media. So far blogs are the only news sources prepared to give the story legs.